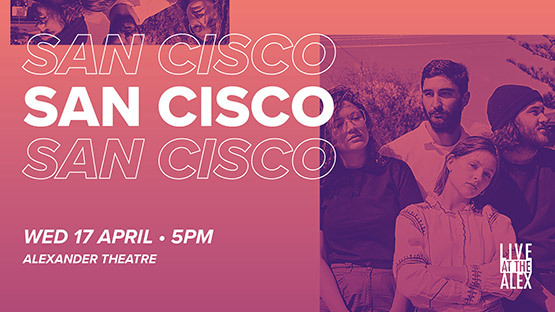 MSA and MLIVE are excited to announce San Cisco will headline Live At The Alex on Wednesday 17 April. $20 presale tickets are now open to students but be quick! They're only available for the first 100 tickets sold. After that students can buy tickets for $30 until sold out. Live At The Alex brings you so much more than live music. Food trucks and drinks at student-friendly prices will make this a night to remember. With three solid albums under their belt, the San Cisco has been a household name in Australia since hitting the scene in 2009. Their latest album, The Water, was met with global success and lead single ‘Hey Did I Do You Wrong’ came in at #79 in Triple J’s revered Hottest 100 of 2017. Follow the event on Facebook to see the support acts announced.